Something smells rotten in Cowtown. Well the Oilers finally won a game against the Calgary Flames tonight. I have lived a long and fruitful life with many highs and lows. Well maybe not that long. As an avid hockey nut I can say many of those experiences have involved the Battle of Alberta. 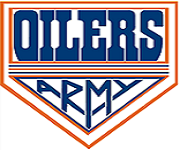 So the fact that tonight the Oilers humiliated their southern neighbors 6-1 firewagon style, is both a high and a low. How can it be both you ask? Well I didn't get the chance to see the game. The Oilers first win of the year against the Flames and I didn't see it. Fortunately I saw the highlights and it would have been nice to have seen it. Obviously the Flames thought they just needed to show up with the 2 points all gift wrapped. How dare their northern rival have the gumption to snuff out the Flames playoff run. I have seen into the crystal ball and it saddens me to reveal that the Flames will not make the playoffs. So the low was me missing the game. The high was, I was actually playing hockey myself. Nothing like getting the ol' blood flowing and going face to face with out of shape middle aged men. Now I don't play in an adult league. Been there done that and won't do that anymore. I've reached the point in my hockey career where playing against 25 year old, is not my cup of tea. The one guy who still thinks they have a shot at the pros. You know what I'm talking about, there's always that one career plumber that believes a scout could be watching. And if it's not the plumber than it's the referee. You can always rely on referees deciding the outcome of the game. No I'm talking about pick up hockey, 20 guys who know each other. A game that has no referee and no plumbers. Well maybe a few plumbers. Ya some argue that there's no competition and maybe that's true. Believe me I still have that competitive fire, especially when my best friend comes flying down the right wing and only has me to beat. Just like that hockey commercial where the defenceman ponders those cherished moments as his buddy skates towards him. No I didn't punish my friend but believe me he was cursing afterwards. Competitive hockey is in the past now. Today I enjoy the game more now than ever. Don't get me wrong, I loved hockey as a kid. I played a high level of hockey and will forever me grateful for that. I still have Tuesday nights to look forward too and I'm lucky to still be able to play a good level of hockey. Even if it's only pick up. Too bad Flames fans can't say that! So which best friend are you referring to?